Camellias laden with flowers bring gorgeous colour to our gardens from autumn to spring. Bees and birds love the flowers. 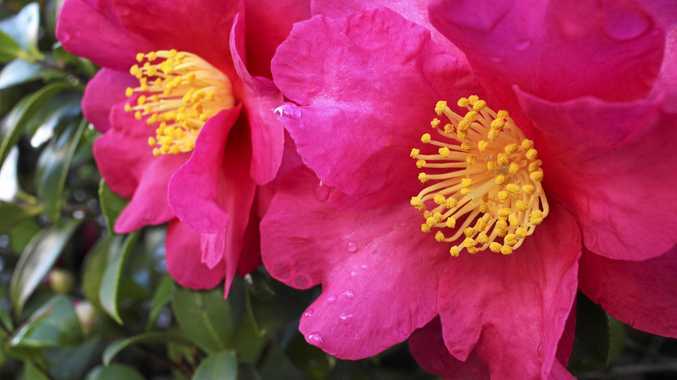 Whether your sasanquas have finished flowering or your japonicas are about to burst forth into beautiful bloom, August is an ideal time to give camellias a good feed using a rose and flower pelletised plant food. This can help them replenish their reserves after busy weeks of flowering or nurture them while they flower. It also helps set them up for fantastic leaf growth. Camellias can be susceptible to attack from scale which can appear as white, grey, black or pink bumps along stems and leaves. Ants crawling up and down stems and sooty mould (a black or dark grey ash-like covering over leaves and stems) can indicate the presence of scale because ants and the mould feed on the honeydew that scale excrete. Scale can be controlled with regular sprays of a citrus and ornamental spray. Ensure all stems and leaves (including the undersides) are sprayed to the point of run-off and repeat every week if required.